I had ordered the Avon Glimmersticks Diamonds Eyeliner Pencils ages back but got them only last weekend. 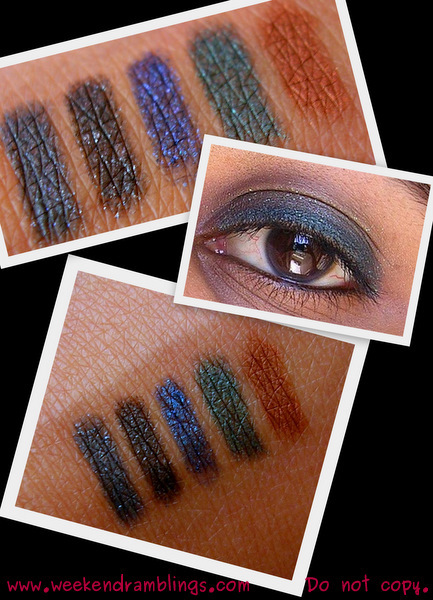 I am in a no-eyeliner phase right now, so I wasn't too excited to finally get these, but once I swatched them I really did like them a lot. Unlike the older Avon Glimmersticks, these have a bit of a shimmer - nothing too obvious, though they do tend to sparkle more under artificial lighting than dayilght. These are retractible pencils, twist to get the pencil out and twist to get it back in. They are quite soft and can break easily if you twist out too much length. The colour stays on quite long and does not smudge unless intentinoally/unintentionally rubbed. The brown colour in the swatches is "Bronze Glow" which is one of the older Glimmersticks - not Glimmersticks Diamonds - and does not have any shimmer to it. I added it in the photos by mistake and later got too lazy to take another set of photos :P :P As for staying power, I found that varies depending on the climate - under more humid/hot conditions, the shimmer particles tend to move around the eye area a bit. This can be reduced greatly, though, with the use of a primer before applying these eyeliners. At any rate, I would recommend these pencils for the more casual/night time rather than a more formal venue and/or day time use. I liked the Avon Glimmersticks Diamonds Eyeliner pencils, more than the regular Glimmersticks. Despite the shimmer, the colours are all pretty wearable, at least for a darker-skinned person like me. I don't think these are suitable for use on the waterline, though. Have you tried these pencils? Do you have a favorite? Cost: About Rs. 150/0.28 g (on discount). ok so bronze glow doesn't have glimmers...still I want to seeeeeeeee..it is looking so gorgeous!! ok do a Black Ice look too!! :D :D ..I feel it will look amazing with Khakhi eyeshadow!!! Bronze one - this Avon one - I don't like too much..it's okayish..but it looks very good on my friend..she uses that all the time..green for upper lining and grey or brown for lower - it sounds too crazy and mad but somehow she looks very pretty when she wears that combination! yeah blue and that black ice too...I think that with Chanel khakhi will look gorgoussss!!! hawwww..use something from inglot too na..I think it has some similar khakhi kinda shade..a bit toned down!! I remember!!!! Aww..you call them and shout at them..and then go see the online catalogue :D How is the brush? I don't like the sponge ends..but I think they are useful for smudging naaa..how much does this brush cost? That's not bad at all! Priya - these stay on - no wandering right up to the eyebrow area kind of tendencies :P :P These aren't very creamy, and that might be the reason. Generally, creamier ones are easier to smudge but then they are also faster to travel all around :P :P ..or so I thinkkkkkk. You can pat some eyeshadow over a smudged pencil, and it will stay on longer. yaa...after some time...i will find more of the eyepencil over the brow area than on the lid :| not creamy but can be spread easily? Oh these aren't that easy to spread as compared to the creamier ones, but it's a nice compromise. Noopur had reviewed a foundation on IMBB - she tried samples - so I assumed other products also might be available in sample sizes. It will be there..was LE..but it's Bangalore..they still have the LE Chanel quad from last year and the year before that also think!!! rads..... the look is very good!!! ???!!! What's technique in a brush? Is not like regular eyeshadow brush?? I need to learn a lotttttttttttt!!! :( Can't continue with those easy peasy tricks forever!!! i'll check with sabrina. These remind me of pearlglides from MAC. how are you doing..Well this is my first comment on your blog.. If could suggest me some purple as in deep purple grapevine kinda eye pencil vch is waterline safe and doesnt smudge I'd be grateful to you..
Hi Dipti..sorry about your comment going missing..no idea what happened :) Oh I love Majestic Plum - I do hope Avon continues to make it. As a replacement, I think Colorbar Prunella is a similar colour, but I do not know if it is waterline safe. Jomol - :P :P :P :P get the rest of the colours also :D :D Are very very nice. he he he... :P Ok..tell those higher end brands then!! :P I need a nice white pencil..the only good one I've found out is Lancome Le Crayon!! Donno how much it costs!!! Chanel has a white - costs around Rs. 1650 I think. Lancome pencils are longer and cost slightly less than that. MAC had a LE pencil, I think, that could be used on the waterline - Chromagraphic? hmmmmmmmm.....I think I'll go for MAC!! Better check at store regarding availability (doubtful :P :P ) and ask if they are waterline safe. yeah..I need waterline safe one..my eyes are small size naa...I avoid putting kajal in my waterline..I usually apply kajal on lower lashline only!! goood eveneingsssss......rads do you think your friend can get all the color phor me ?????? Ya she could - but it's costing Rs. 229 this month - no discount on it. I am so sorry..It's 189 on discount..I mixed up the price..you can also check it online every month in the brochure. The ones with shimmer - the old ones are there for 150 Rs. heyyy cali....today friday again...lol...this week the friday was quick :D....wht plans ???? Rads, sorry to reply so late and after so many commnets. I am in love with their lipbalm, especially the strawberry flavour..love it. Its not very moisturising but i just love its strawberry frangrance and tint..
"Doesn't show up on any blogs"??? I am not quite sure what the problem is but could you mail me about this? Dipti - A friend of mine was telling me that the older Glimmersticks are still available - so you should be able to get Majestic Plum. I will write you a mail..thanks so much..
these look so nice... i really want this!!! And yes, it doesnt smudge n is water proof as well. So now i dont hv to worry abt my looks once applied it.